Funko has released an Infinity War Movie Moment POP! set that pays attention to the continuity of the movie. The figure in question pits Steve Rogers up against Thanos, which is featured in the movie and was one of the big teasers from the trailers that were released. Like most of their vinyl figures, the amount of detail is impeccable, but Marvel Cinematic Universe fans are appreciating it for a very specific reason, instead of how awesome the two characters look. A closer look shows that Funko's Infinity War Movie Moment POP! did not give Thanos the Mind Stone, which is accurate since he had just arrived on Wakanda and had yet to gain the Stone at that time. Thanos had traveled from Titan to Wakanda and was easily throwing Avengers around to get to Vision and Scarlet Witch. It's a small detail, but one that MCU fans are appreciating. The special set was a Black Friday exclusive for Hot Topic stores and retailed for $25. The sets are currently being sold for nearly twice as much from third-party sellers. In addition to the awesome Infinity War Movie Moment featuring Thanos and Captain America, Funko is also releasing a version of Thor taking on the Mad Titan with his Stormbringer Axe. Much like the one with Steve Rogers, this set looks equally cool and finds the God of Thunder surrounded in his blue lighting, while Thanos has the axe in his chest. This is right before the Mad Titan is able to snap his fingers and turn half of the universe to dust, a moment that MCU fans will never forget, especially if they buy this set. 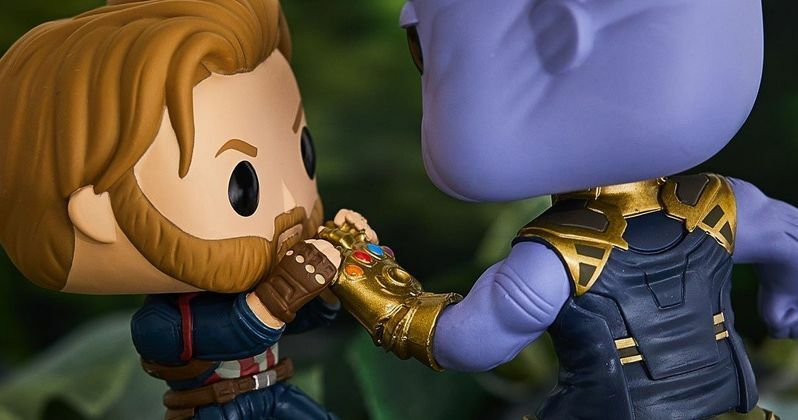 On second thought, the Thor and Thanos Movie Moment POP! set might bring up too many bad memories for Infinity War fans who were bummed that Thor delivered a speech instead of directly taking out the villain when he had the chance, much like Star-Lord on Titan when he became too emotionally enraged, which let Thanos free. There are more than a few MCU fans who blame Thor and Star-Lord for letting Thanos complete his quest at the end of Infinity War, which is somewhat true. However, we wouldn't have an Avengers 4 to look forward to now. It appears that the Infinity War Movie Moment POP! featuring Thanos and Captain America is currently sold out online, so if you're interested in one, you might want to call your local Hot Topic or pay twice as much from a third-party seller. As for the Thor and Thanos version, that set will be available everywhere, starting in January 2019. However, you might want to jump on a pre-sale, wherever POP! figures are sold to guarantee a set. You can check out both of the awesome Funko Infinity War Movie Moment POP! figures below, thanks to the Funko Twitter account.